To say Tom Garrett has been a busy man since we last profiled him in 2015 would be a gross understatement. When we first met up with Garrett, his Atlanta-based GPS Hospitality company was operating 196 Burger King locations. The industry veteran had become a franchisee of the brand during a refranchising push in 2012. During the past two years he has grown GPS to 376 Burger Kings and added 19 Popeyes to the mix. But fast growth and big numbers are nothing new for Garrett. Garrett previously worked at RTM Restaurant Group, which operated 775 Arby's when the company was sold back to the franchisor, Triarc Companies, in 2005. At that point, he moved from president of RTM to COO of the newly formed Arby's Restaurant Group, a wholly owned subsidiary of Triarc. He left the company in 2010, as CEO. "I can't say it was fun, but those 5 years made me tougher and smarter and better prepared to go back to what I love: being a multi-unit franchisee," he told us in 2015. The call of the multi-unit operator brought him back to life on the franchisee side. GPS Hospitality was formed in October 2012 with the acquisition of 42 Burger Kings in Atlanta. That was just the beginning. The acquisitions and store openings kept adding up, and last year he hit the mother lode. In December 2016, GPS Hospitality acquired 194 Burger Kings in Alabama, Arkansas, Florida, Louisiana, and Mississippi. "Since 2015, we have continued to grow through acquisition of Burger King restaurants, including our largest acquisition to date, which allowed us to almost double in size and put us firmly among the top three largest Burger King franchisees in the United States," he says. But there was even more to the business plan in 2016. It began when Garrett's company acquired 7 Popeyes in Georgia. 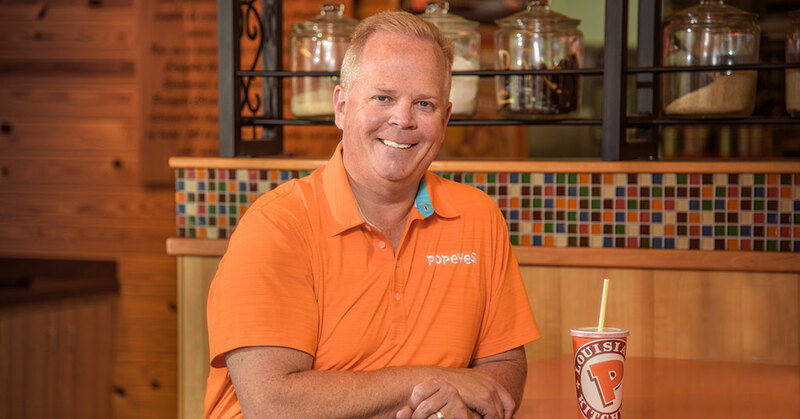 "Aligned with similar core values, we saw Popeyes as a highly recognizable brand for guests, as well as an organization that has solid plans to sustain the momentum they've achieved over the past few years. This year, we purchased 11 more restaurants," he says. Garrett likes to take care of his business and his employees. "From the beginning, we've remained committed to investing in both our people and our facilities," he says. "In 2016, we remodeled 19 and built eight new Burger King restaurants. We're on track to remodel more than 40 and build 10 new locations this year." GPS Hospitality is on a path to reach $1 billion in revenue during its first 10 years, says Garrett, who has named the goal "Journey to 1 Billion." "To help us reach that goal, we decided to hire industry veteran Michael Lippert as our chief operating officer. He brings more than 30 years of QSR experience and a shared vision for growth and development of a world-class team," he says. There's no telling where Garrett's GPS Hospitality will be in another 2 years. He says his next big goal is 650 restaurants and $1 billion in sales. Wendy's in Rainbow City, Ala. Joined RTM Restaurant Group as an assistant manager for Arby's in Gadsden, Alabama with the intent of working there a couple of years before attending college. Instead I spent 25 years with RTM, serving as president my last few years. I am the leader I am today because of to the influence of Russ Umphenour and my former partners at RTM. Rapid, successful growth of GPS Hospitality. 650 restaurants and $1 billion in sales. I got my first experience as an entrepreneur when I was promoted to vice president at RTM Restaurant Group. It was there I really learned all the different ways I could grow a business and motivate people to succeed. Starting GPS Hospitality and assembling a team of top performers. Staying in a bad investment too long. I don't like to quit. Every day starts after I take my daughter to school and ends when it ends. I do try to focus on my family and my children's sports on the weekends, but I do touch the business every day. Be yourself. Don't pretend to be what you are not. I love the challenge presented by growth, whether it is helping a person grow or growing a business. It is very fulfilling, never boring, and requires many different skills. We encourage everyone on our team to make family activities, soccer games, and ballet recitals a priority, and I am sure to set the example. Purchased a new Ranger Bass Boat this year. Took the family to see Wimbledon this summer. We like mature brands that offer operations upside measured in sales and/or margin improvement. We see/create value that many overlook. Surround myself with smart people who possess common values, align them with exciting goals, share generously as the business grows, and make certain we have the people and systems to sustain it. Making sure we have the team to sustain our growth rate. I believe in encouraging risk-taking and trying new things with most people. I don't believe in letting incompetent people try things in the spirit of innovation. My role is focused on the growth side of our operations: preparing for growth by ensuring we have the people for sustained growth, maintaining and building a consistent culture, and identifying opportunities that fit our strategy. 1) Brand integrity (compliance), and 2) brand relevance (marketing communication). Resources--the talent and systems to support the growth of our company. We focus on improving operations, which helps create value for our guests. The Popeyes and Burger King brands are part of pop culture, making it very relevant within social media. We use social media to raise the awareness of GPS Hospitality and recognize our people for their accomplishments. We apply our values (Goal Focused, People Oriented, Service Obsessed) to all people decisions, including hiring and firing. This filter helps us determine who belongs on the team and who does not. We provide the tools and the environment for people to succeed, but we expect the trainee to be accountable for their training. We retain people by providing them with personal growth opportunities and rewarding and recognizing their successes. It depends on the problem. I have little patience for people who don't fit our values. I do believe in providing the training and coaching necessary for people to succeed. Against our goals: did we accomplish what we set out to do. We call it "Journey to 1 Billion"--reaching $1 billion in sales within our first 10 years. Improving. GPS operates 395 restaurants in 11 states: Alabama, Arkansas, Florida, Georgia, Louisiana, Michigan, Maryland, Mississippi, New Jersey, Pennsylvania, and West Virginia. QSR rises and falls on disposable income. Improving employment and low inflation are improving the outlook for GPS Hospitality. We have a five-year outlook, a one-year annual budget, and a weekly cash forecast. Senior debt, equity from family office investors depending on the transaction. We do not believe that private equity capital is a good fit for our company. We believe that our success is directly tied to the success of our team. We encourage our people to set personal goals and we look for ways to help them achieve them. As they succeed in accomplishing their goals, both personally and professionally, our company wins. We offer competitive salaries and very aggressive, unlimited bonuses based on growth. Since every employer faces the same issue, we look for efficiencies and adjust, just as our competitors have to do. Our culture is all about motivating everyone on the team to perform at a high level. We focus all of our incentives and recognition on this group, which encourages everyone to grow and improve. We are very generous in our reward system. As we grow our business, we share a significant percentage with the management team.